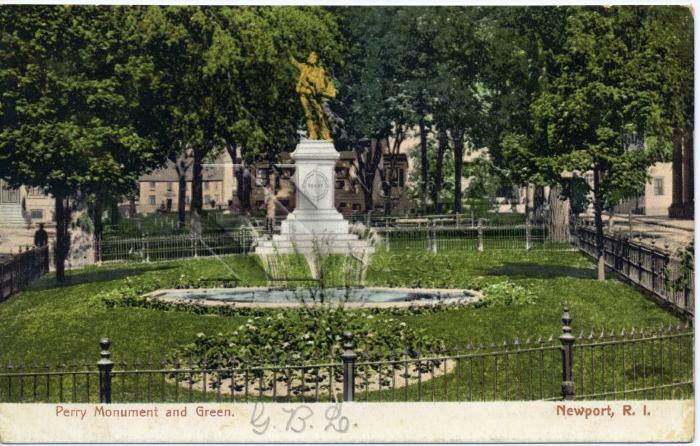 Rhode Island News Company, Inc.
A color postcard depicting the Oliver Hazard Perry Monument in Washington Square. A fountain and a flower bed are found at foreground; trees are visible throughout. The Levi Gale House is visible behind the Perry Statue at center. The initials "G.B.L." are handwritten in pencil at bottom edge. Postcard does not have a divided back. Postcards without a divided back (only address space) were produced between 1898-1907.